I wrote this back on June 5, 2017 before I went back to Cambodia for the second time that year. To give it away... this experience solidified my decision to pursue a career in teaching, and I am proud to say that I will be starting Teach for America in Providence, Rhode Island in June 2018. 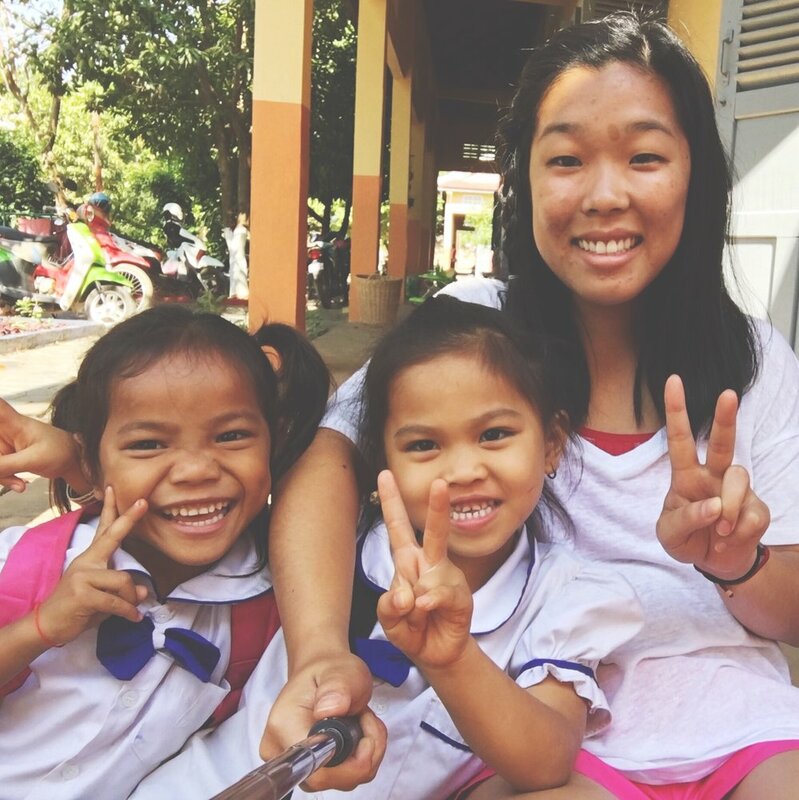 As some of you may know, I made the decision to put my life in the US on hold and return to Cambodia on a one way ticket to volunteer with Caring for Cambodia. It has almost been a year since I quit my job in Corporate America to "figure out" what I wanted to do with my life - and I've tried really hard over the past few months to do just that. In this post, I'll talk about how I think I figured it out, and what compelled me to go back to Cambodia. This wasn't something new. My mom raised me doing a lot of volunteer work around Austin throughout middle and high school. Unfortunately my time commitment to giving back and serving others dwindled as the years went on. By the time I was working full time and back in Austin, I was not volunteering at all and any sort of "volunteering" had 100% to do with monetary donations versus donating my time. When I made the decision to leave the company I had been with for 3 years, volunteering was the number one item on my to-do list. Not just around Austin, but also finding an opportunity to volunteer abroad. Then a family friend connected me to the founder of Caring for Cambodia, and the planning for my March trip began. Family & friends helped me raise enough money to pave a whole area of a school! It was SO hard, but the students helped pass stones back and forth and the experience was worth the sweat. I was nervous to go to Southeast alone, so thankfully I had my best friend, Chinasa, with me. We split the trip 50/50 between volunteering and leisure travel. The 50% spent volunteering will forever have a lasting impact on me. Knowing the history of the country and seeing the poverty of these children, it amazed me how happy all of the kids were and the constant positive energy you felt at each and every school. Once the kids warmed up to you, all they wanted was to play with you and hear you speak and be around you. It was such a warm and welcoming experience and it wasn't like anything I had experienced before. You could be having the worst day ever, but 10 seconds around these kids, and you would forget about anything bad. It was truly amazing, and I can't wait to see all of the kids again! We were spending each morning and afternoon at a different school since it was our first time in Siem Reap, and the staff at Caring for Cambodia (will refer to it as "CFC") wanted us to see all of those schools and differences depending on location and number of years associated with CFC. At one of the schools, there was a young 8 year old girl attending the first section of the English as a Second Language ("ESL") class that Chinasa and I were volunteering in. She sat by me, she played with the ends of my kimono, and she stayed for the second section too. Not sure why, but she attached to me and worked so hard to communicate with me in as much as English as she knew. Me: "No, I'm sorry, we are going to a different school tomorrow." Young Girl: "Ok, when will I get to see you again?" Young Girl: "Ok, well come back very soon, ok?" Me: "Yes, I will do my best!" This series of questions almost brought me to tears, but it sparked the question/thought - When will I come back to Cambodia? Wait, I really want to come back to Cambodia. Our time was split between assisting in the ESL classrooms, and doing a building project at one of the schools. I loved my time in the classroom because I have always loved being around kids, and as stated in point #2, these kids had a certain energy about them that made the experience so memorable. They were all so eager to learn - I never had that kind of thirst for learning, even though I loved being in school and do consider myself to be a tad nerdy. They all called me "teacher" and would address me that way if they had a question or wanted me to sit at their table for the next exercise. So I started thinking, teaching elementary school could be something to explore. After all, my grandfather and grandmother were teachers, my mom was a pre-school teacher and teaches ESL in Japan, and my brother is a high school math teacher. Maybe it's just something that runs in the family? I loved every minute spending time with the students. They radiated such great energy and an eagerness to learn - it was beautiful! Last but certainly not least, this was an opportune experience that would help me grow outside of my comfort zone. I'm definitely a home-body; I love being close to my parents; and I have never lived outside of Texas (minus the first 5 years of my life in NYC and a college semester abroad in Florence). This was my chance to be entirely on my own - travel alone, live alone, be alone, and all other forms of alone. As nervous as I am about this aspect, I know that it will only help me grow into a stronger and better person.